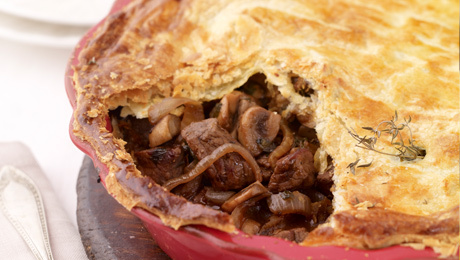 What a fabulous pie... you'll love this recipe! Heat half the oil in a large saucepan over a high heat. Add one third of the beef and cook, turning occasionally for 3 – 4 minutes or until well browned. Heat the remaining oil in the pan over a medium heat. Add the onion and cook for 5 minutes until soft and lightly caramelised. Add the mushrooms and garlic and cook for a further minute or two, then sprinkle over the flour and cook for a further minute. Gradually stir in the stock and red wine and use a wooden spoon to release any remnants from the bottom of the pan. Add the tomatoes, herbs and thyme, and reduce the heat. Simmer covered for 1hr 30 mins until the beef is very tender and the sauce is thick. Transfer the beef mixture to a round, 23cm ovenproof dish. Set aside for 20 minutes to cool slightly. Roll the pastry on a lightly floured surface and cut a 2cm strip off the edge of three sides. Place the strips around the edge of the dish slightly overlapping. Cover the filling with rolled pastry and use your fingertips to seal the edges. Brush the pie with the egg wash and pace in the preheated oven for 25 – 30 minutes or until the pastry is puffed and golden brown.